is a great way to let everyone know what to bring, provide directions, organize flight arrival times and even plan some post-Thanksgiving events, like football marathons or a little exercise to burn off those pumpkin pie calories. 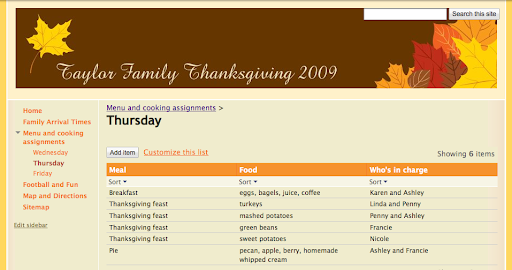 Use a list page to split up the cooking and show your family what meals they need to prepare. You can also embed a Google spreadsheet to keep track of everyone's arrival times and get volunteers to pick people up from the airport. You can even insert a flight arrival time gadget so you can avoid circling the airport by making sure flights aren't delayed. To find this gadget, choose 'More gadgets' from the 'Insert' menu and then search for "flight." Adding announcements to your site will help family members get up to date information. You can display the announcements on the front page of your site, or your family can subscribe to RSS feeds so they get updates whenever there is a new announcement. 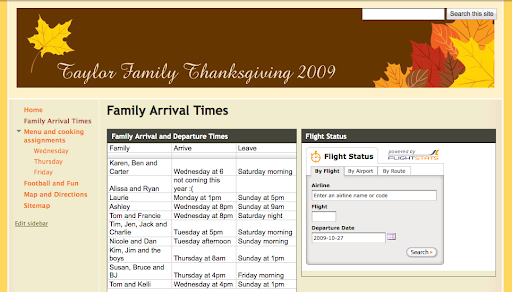 Hopefully Sites and Docs make planning your Thanksgiving a little easier this year. Happy Thanksgiving from everyone on the Google Docs and Sites teams. Every year families come together from all over to celebrate the Thanksgiving holiday. To some people, Thanksgiving brings to mind images of family gathering around a turkey dinner and catching up over heaping servings of pumpkin pie. Others, especially the hosts and hostesses out there, worry about the stress of cooking for 20 people, getting stuck in traffic, picking up relatives from the airport and figuring out where everyone will sleep. If you fall into the second group, why not use Google Docs and Sites to help organize your Thanksgiving chaos this year? A Google Site is a great way to let everyone know what to bring, provide directions, organize flight arrival times and even plan some post-Thanksgiving events, like football marathons or a little exercise to burn off those pumpkin pie calories.